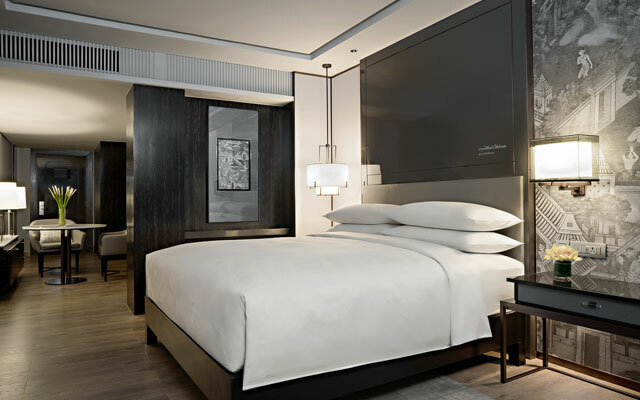 Standing in the Ploenchit area, the 20-year-old JW Marriott Hotel Bangkok is staying fresh with a makeover that is currently underway until mid-2019. The completion of the revamp’s first phase in December 2017 added 130 luxury rooms and suites, while the second phase is due to finish this fall with 178 rooms. Established Thai architecture firm, PIA Interior Company, was tasked with outfitting the accommodation with a new look. The result are rooms and suites exuding understated elegance, melding traditional Thai elements with modern touches. The lightwood flooring matched with neutral gray and brown tones to give the space a sophisticated yet relaxing feel. Despite its understated look, the expansive suite at closer look will rich decor features, such as a glass-encased royal barge sculpture (complete with engravings of mythical creatures), grey-and-white murals depicting life during Thailand’s olden days, and poems of the legendary Thai poet Sunthorn Phu inscribed on the bed headboard. The accommodation enhancement also kept functionality in mind, with the traditional desk ditched in favour of a lounge area that comes with a plush sofa, adding to amenities such as a kitchenette, flatscreen TV, and a sleek bathroom. JW Marriott Hotel Bangkok offers 1,400m2 of flexible event spaces spread across three floors. Spanning a variety of sizes between 56m2 and 470m2, most meeting rooms are named after iconic areas in the hotel’s vicinity – think Lumpini, Ploenchit, Sukhumvit, etc. The Grand Ballroom, which was given a facelift in 2014, can accommodate up to 600 guests, and is equipped with the latest audiovisual technology and LED lighting. The hotel has eight F&B outlets in total, offering a selection of cuisines ranging from the New York Steakhouse to the Tsu Japanese Restaurant. For relaxation, there’s a health club and spa, outdoor swimming pool, and whirlpool. If the new suite is a sign of things to come, I’m looking forward to the completion of the facelift in 2019.